As I mentioned in our Holiday G.I.F.T. 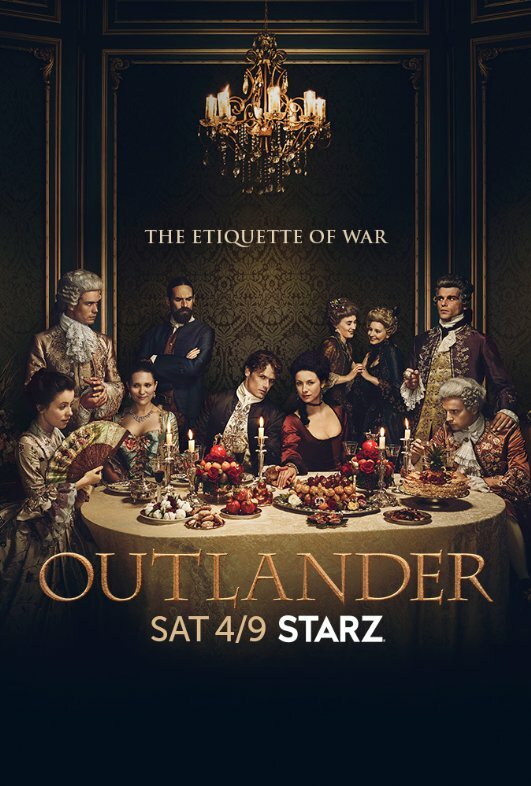 Guide (that thing keeps coming up again and again and again), I went to Scotland in 1997 with Diana Gabaldon, author of the Outlander series, which has been developed into a popular television show on Starz that will begin its second season this Saturday, April 9th. Flushed from too much Scotch whiskey with Diana at the Stakis Grosvenor Hotel in Edinburgh. Looking back, I’m not sure why Diana agreed to do it. If I was an author, being trapped in a foreign country with a bunch of fangirls would be my worst nightmare, but she was gracious and accommodating, making herself available to sign our books and answer our endless questions about the series. Her fourth novel, Drums of Autumn, had just been released, so the trip doubled as a book tour of sorts. Walking into one store, we were amused to see Diana’s novels displayed with other “Books by Scottish Authors,” since she is an American who had never set foot in Scotland prior to writing the first book in the series. For those of you who are unfamiliar with Outlander, the novel is told from the perspective of Claire Randall, a British World War II combat nurse who, while vacationing in the Highlands of Scotland with her husband after the war, is transported through a circle of standing stones to 1743. There, she encounters her husband’s ancestor—a sadistic Redcoat—and a band of Scottish clansmen that includes Jamie Fraser, a man who will force her to choose between two different lives and two distant centuries. The series is enthralling, with its combination of historical realism, eloquent prose, pulse-pounding adventure, and passionate romance. Back in 1997, Diana accompanied us to Clava Cairns, a prehistoric burial site near Inverness surrounded by stone circles that inspired Craigh na Dun, the fictional circle through which Claire travels back in time. We also visited Culloden field, site of the definitive battle between Scottish clans and British troops that, within the space of an hour, brought an end to the clan system and changed the course of Scotland’s history. There was a tangible sense of grief pervading the area, making us aware that the characters Diana wrote about in her books had flesh-and-blood counterparts who shed that blood on the very field beneath our feet. During the trip, a few of us formed a group of friends, one of whom let us in on a little secret. Back in the states, she had done research on contemporary silversmiths in Scotland, trying to locate someone who could recreate the wedding ring that Jamie gives to Claire in Outlander, described as “a wide silver band, decorated in the Highland interlace style, a small and delicate Jacobean thistle bloom carved in the center of each link.”† She found a woman in Stirling who employed 18th-century techniques to fashion silver jewelry with Scottish motifs. On one of our free days, we met with this woman to discuss the ring and place our orders. 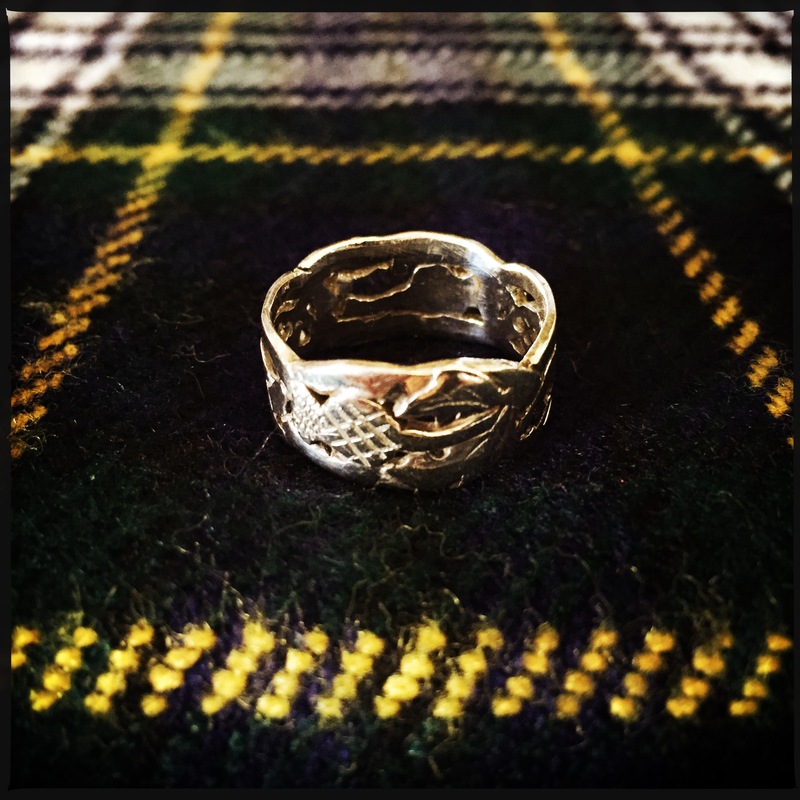 Her final design was more rustic and had larger elements than the ring described in the book, but I still treasure it as a memento of the trip and an authentic piece of Scottish artistry. Twenty-three years after its publication, I was thrilled to see that Outlander was being made into a series for television. Like most fans, I worried about casting and changes to the story, but everyone involved in the production did a fantastic job of bringing Diana’s first novel to life. 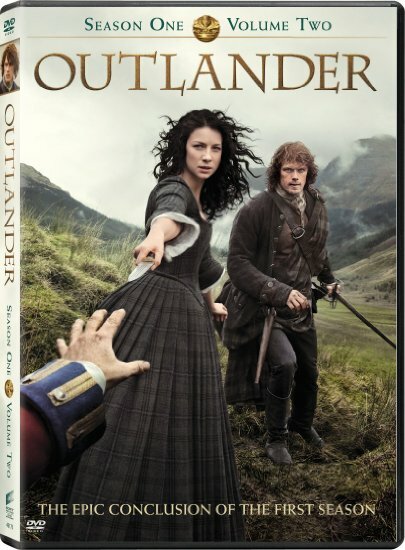 Season One is out on DVD (in Volumes One and Two) and available for streaming, so there’s still time to tie yourself up in Scots by setting your DVR to record the new season as you catch up on the previous one. With the series currently standing at eight full-length novels (a ninth is in progress), two novellas, one short story, a graphic novel, and a spin-off series (more of a “sub-series”), the producers should have plenty of material to keep the show going for years. And with some of the highest viewership in the history of Starz, that’s not an outlandish assumption. *Technically, I hopped on a plane to New York City on April 7th in order to meet up with part of the RT group on the 8th. We flew to Iceland for a two-day pre-tour in Reykjavík before flying to Scotland on the 11th to join the rest of the group. †In the Starz adaptation, Jamie gives Claire a wedding ring made from the iron key to the front door of his home, Lallybroch. It may have been a sentimental choice, but it is not a particularly attractive one.